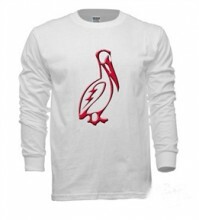 Pelican Long Tee - White - STØLÅS Watch Co.
Click the button below to add the Pelican Long Tee - White to your wish list. Grab yourself a hot STØLÅS Long Sleve TEE! This T-Shirt features our Official Pelican Logo on front and our STØLÅS Maritime Instruments on back. This shirt is 100% cotton and machine washable. This Shirt fits both Men and Women GREAT!